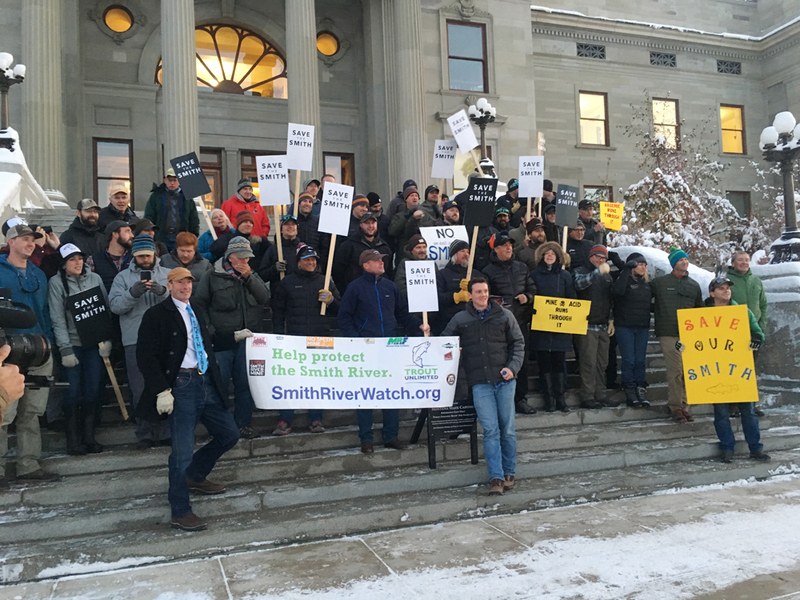 HELENA – Legislators, scientists and leaders of the outdoors industry were just some of the almost three dozen Montanans who traveled to Helena to voice their comments on a proposal to mine copper along a tributary of the Smith River. More than 200 people funneled into a Radisson Hotel conference room Monday night to learn about the proposed Black Butte Copper Project and hear people speak to the Montana Department of Environmental Quality about the pending environmental study. “I’m asking for time – DEQ has said, publicly and rightly, that it’s a huge challenge to do (an EIS) in a year. Go find another mining state that has that kind of shackle on the time that you have to complete an EIS. But the only way you can get more time is to request it of the company. So Tintina, if, as you say, you want to do it right from the beginning, you need to grant DEQ more time to do this sufficiently,” said Montana Trout Unlimited Director David Brooks. Tintina Resources, now a subsidiary of Australia-based Sandfire Resources NL, began submitting proposals in 2012 to construct an underground copper mine in the Little Belt Mountains northeast of White Sulphur Springs. Fishermen and recreationalists who treasure the Smith River were immediately alarmed because the mining would take place within a half-mile of Sheep Creek, a major tributary of the Smith River. If mining operations either reduced the flows of Sheep Creek or polluted the waters, the trout of the famed Smith River could be wiped out and the 58-mile permitted river trip, which continues to grow in popularity, would be ruined. Since then, business, environmental and sportsmen’s groups have teamed up to oppose the mine or at least ensure that DEQ was diligent during the approval process. After rejecting Tintina’s application a few times for minor details, the agency finally approved the application in July. The approval prompted the upcoming environmental impact study under Montana’s Environmental Policy Act. Monday night’s meeting was the third of four scoping meetings being held this week in central Montana, but it had the biggest audience, and most of the people there to oppose the mine. DEQ Environmental Policy Act Coordinator Craig Jones told the crowd the meeting wasn’t a popularity contest. The agency was only interested in hearing ideas that they might need to consider in the study. Jones asked people not to applaud after anyone spoke. However, the applause that sputtered throughout the evening indicated some couldn’t contain themselves. Six of the 35 speakers rose in support of the mining plan, including representatives of the Montana Association of Contractors, the Montana Chamber of Commerce and the Montana Business Assistance Connection, a Helena-based consulting company. They advocated primarily for the money the mine would bring to the state. State Sen. Terry Gauthier, R-Helena, suggested the mine could aid the state’s budget woes. However, the EIS wouldn’t be complete for at least another year so the mine wouldn’t start making money and paying taxes until long after the state needs to fix its budget. “We’re $220 million bucks in the hole, and we have to figure out how to collect some revenue. We could get some great revenue from this mine without having to go to the people and raise the taxes on everything we buy,” Gauthier said. Mine opponents pointed out that pending state budget cuts mean DEQ is going to be hard-put to oversee a proper study and then monitor mining operations. State Rep. Mary Ann Dunwell, D-Helena, a former DEQ remediation worker, said a reduced DEQ staff would not be able to handle the setbacks that always plague mining operations. Outdoor business leaders such as Simms Fishing Products chairman KC Walsh and Orvis owner David Perkins said their businesses and employees would be affected if mining pollution ended up in the Smith River and killed its famed trout. The mining company intends to extract acidic waste rock from the mine, more than half of which would be stored in a lined tailings ditch above ground. Should the complicated water-purification equipment fail during Montana’s cold winters or the lining leak - which they always eventually do – the acid could pollute the ground water and enter Sheep Creek, which is only 17 miles from the Smith River. Biologists said that the wildlife and fisheries inventories of the area were inadequate and incomplete. A number of species were left out, including wolverine, lynx and grizzly bears, and the effects of climate change haven’t been considered, said guide and wildlife biologist Steve Gilbert. Former Fish, Wildlife & Parks fisheries biologist Jerry Wells said thorough studies of the Sheep Creek fishery haven’t been conducted but its importance to native trout as a spawning area and a cold-water refuge is critical, especially during low flows. “In-depth work needs to be done and it needs to be done now. The groundwater connection to Sheep Creek is unknown but the mine proposal, they’re talking about pumping all kinds of ground water, so the potential impacts to Sheep Creek are huge,” Wells said. Several people argued that while Tintina is proposing a 14-year project, the company has bought enough mineral leases in the surrounding area that it could continue mining for 50 years “once it gets its foot in the door.” So the proposed environmental study of the initial project wouldn't be comprehensive enough. As an example of how that can happen, Montana Environmental Information Center attorney Derf Johnson pointed to the 14 mine expansions that the DEQ has approved over the years after the Golden Sunlight Mine was permitted near Whitehall. “We can’t evaluate this project piecemeal. We need to look at the cumulative impacts should this entire (50-year) project move forward. Because that’s what they’re selling to their investors and that’s how they want to make money,” Johnson said. DEQ is accepting public comment until Nov. 16. Email comments to deqtintinablackbuttecopperprojet@mt.gov.